Visitors welcome by appointment. Conservatory is suitable for small groups of up to eight, and is wheelchair friendly. Wine tasting and purchase are only available to those aged over 18 years, but accompanied children are welcome to join vineyard tours. Well behaved dogs on leads are welcome, but please arrange this in advance so we can confine the hens to their run. 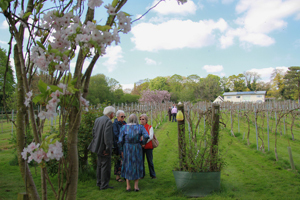 B) Arrange a small group of up to eight friends for a full vineyard tour + wine tasting outside or in the conservatory. You buy wine at RRP for the tasting, and price depends upon wine requirements. 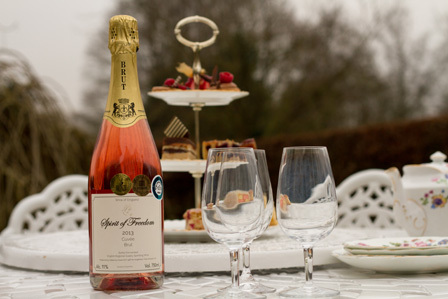 You are welcome to bring your own picnic, as wine tastings go well with food! Cutlery/crockery provided. Day and time to be mutually convenient. C) Book onto a vineyard tour and tutored wine tasting with Laura Hadland, the restaurant critic from Thirst Media, starting at £15 per person. These run monthly on weekend afternoons, and suit those wanting to come individually or in couples. If you have questions about your booking please phone 07465 221264. 2019 events will be held with on the following afternoons: 20 April; 5 May; 26 May; and other dates will follow. Tutored wine tasting can also be arranged for groups at a mutually convenient date. Please contact us to discuss date and cost. Please contact us by email rothleywine@btinternet.com or phone 0116 2375168 to discuss further. See the history page for other nice places to visit while you are in the area.